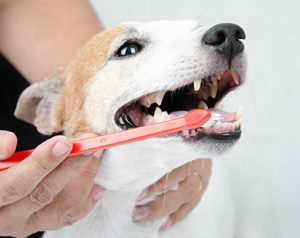 You can start brushing your pet’s teeth at any age, but it will be easier to teach a puppy or kitten than an adult. Make it a positive experience that includes lots of rewards and praise. It’s a good idea to start by wrapping some gauze around you own finger and let the dog get used to you rubbing their teeth. Your finger smells familiar and is much less intimidating than a plastic brush. Get a specially designed pet toothbrush and toothpaste – human toothpaste should not be used on pets – and start by showing the items to your dog. Let them take their time to get used to the brush. Once you start brushing, focus on the gumline and make a routine out of brushing. Every day is the best, but a few times per week is much better than not doing it at all. Some common warning signs for dental issues include bad breath, loss of appetite, sensitive mouth, loose teeth, missing teeth, and problems chewing.